We decided to leave Lavacolla early, to get ourselves the best chance of making the midday mass in Santiago. 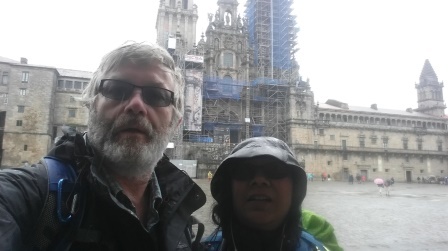 Given this is Pat’s first Camino, we wanted to be able to have the opportunity to go to as many masses as possible, so that at least she’d have a chance of seeing the Botafumeiro swing. We actually got up at 5:30 am, as breakfast in the hotel was served from 6.